This could be the next big thing in SEO – bot interactions from the search result page. Users can get their questions answered quickly or get common tasks done, without even needing to leave the search results and visit your site! The best thing is you don’t even need to be a programmer with my step-by-step guide to making your own search engine bot! In this three part series we’re going to go through a worked example for me to create a bot for my website: thoughtstuff.co.uk. 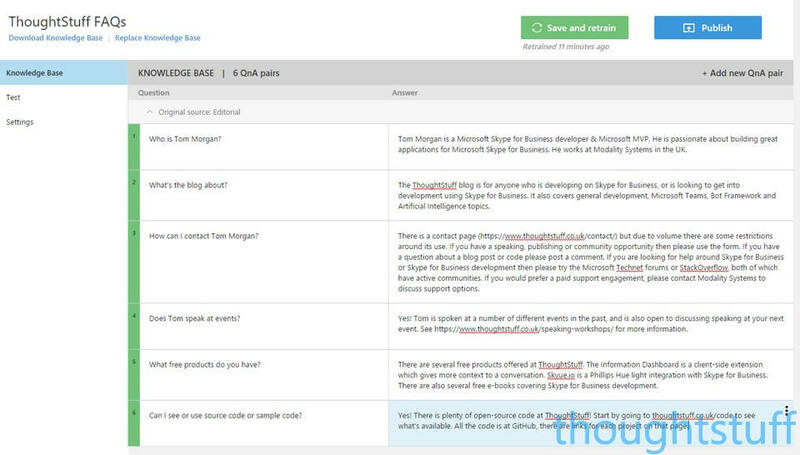 In Part 1 we’re going to create a knowledge base of questions which users can ask. In Part 2 we’ll create the bot which will take those questions and return answers. In Part 3 we’ll configure the bot to show alongside webpage results. Click “Create new service” to get started. Give your service a name. If you already have a website FAQ, then enter it in the company FAQ page section. This will save you time as the service can “read” your FAQ and build up question-answer pairs automatically. If you don’t have one don’t worry, you can ignore it. I’m not going to specify one here, I’m just going to click Create. There’s probably a lot more that could go here. The good thing is that you can always come back here and add more entries, edit these entries etc. At this point we have a knowledge base of useful information which we have seeded. In Part 2 we’ll look at how we create a bot to take questions from users and provide answers based on this knowledge base.